Please join us for a technical seminar with with Dr. J.N. Reddy. 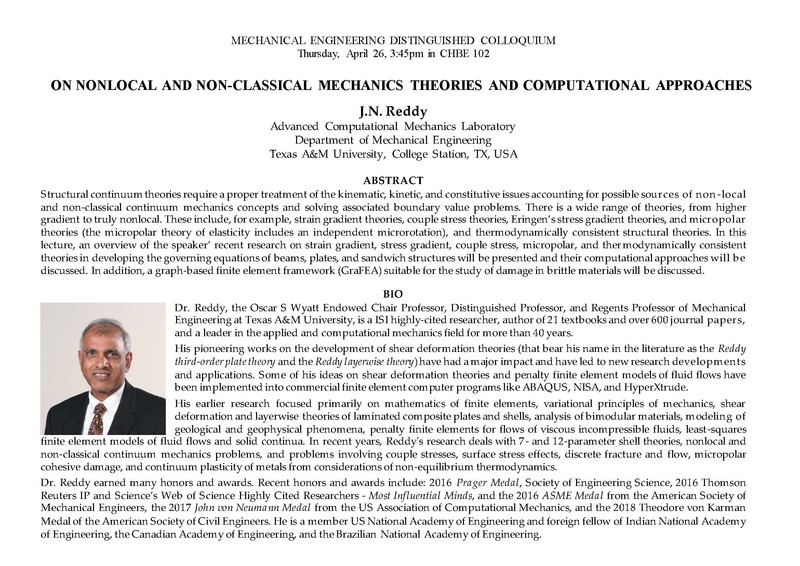 Dr. Reddy, the Oscar S Wyatt Endowed Chair Professor, Distinguished Professor, and Regents Professor of Mechanical Engineering at Texas A&M University, is a ISI highly-cited researcher, author of 21 textbooks and over 600 journal papers, and a leader in the applied and computational mechanics field for more than 40 years. His pioneering works on the development of shear deformation theories (that bear his name in the literature as the Reddy third-order plate theory and the Reddy layerwise theory) have had a major impact and have led to new research developments and applications. Some of his ideas on shear deformation theories and penalty finite element models of fluid flows have been implemented into commercial finite element computer programs like ABAQUS, NISA, and HyperXtrude. His earlier research focused primarily on mathematics of finite elements, variational principles of mechanics, shear deformation and layerwise theories of laminated composite plates and shells, analysis of bimodular materials, modeling of geological and geophysical phenomena, penalty finite elements for flows of viscous incompressible fluids, least-squares finite element models of fluid flows and solid continua. In recent years, Reddy’s research deals with 7- and 12-parameter shell theories, nonlocal and non-classical continuum mechanics problems, and problems involving couple stresses, surface stress effects, discrete fracture and flow, micropolar cohesive damage, and continuum plasticity of metals from considerations of non-equilibrium thermodynamics. Dr. Reddy earned many honors and awards. Recent honors and awards include: 2016 Prager Medal, Society of Engineering Science, 2016 Thomson Reuters IP and Science’s Web of Science Highly Cited Researchers – Most Influential Minds, and the 2016 ASME Medal from the American Society of Mechanical Engineers, the 2017 John von Neumann Medal from the US Association of Computational Mechanics, and the 2018 Theodore von Karman Medal of the American Society of Civil Engineers. He is a member US National Academy of Engineering and foreign fellow of Indian National Academy of Engineering, the Canadian Academy of Engineering, and the Brazilian National Academy of Engineering. Structural continuum theories require a proper treatment of the kinematic, kinetic, and constitutive issues accounting for possible sources of non-local and non-classical continuum mechanics concepts and solving associated boundary value problems. There is a wide range of theories, from higher gradient to truly nonlocal. These include, for example, strain gradient theories, couple stress theories, Eringen’s stress gradient theories, and micropolar theories (the micropolar theory of elasticity includes an independent microrotation), and thermodynamically consistent structural theories. In this lecture, an overview of the speaker’ recent research on strain gradient, stress gradient, couple stress, micropolar, and thermodynamically consistent theories in developing the governing equations of beams, plates, and sandwich structures will be presented and their computational approaches will be discussed. In addition, a graph-based finite element framework (GraFEA) suitable for the study of damage in brittle materials will be discussed.